What is the co-op connection card program? You can start saving money right now by using your Co-op Connections Card at businesses where you normally shop. As a member of Dakota Energy Cooperative, a Touchstone Energy cooperative, you can receive discounts on products and services from participating local and national businesses. There are other cooperatives nationwide participating. Take advantage of special deals offered only to Co-op Connections Cardholders from national retailers such as Barnes & Noble.com, Hertz, Omaha Steaks and Sherwin-Williams Co. and many hotels/motels. Also included with the card are 10% – 60% discounts on prescriptions at participating pharmacies. Search online to find discounted prices on prescriptions www.rxpricequotes.com and participating locations www.locateproviders.com. 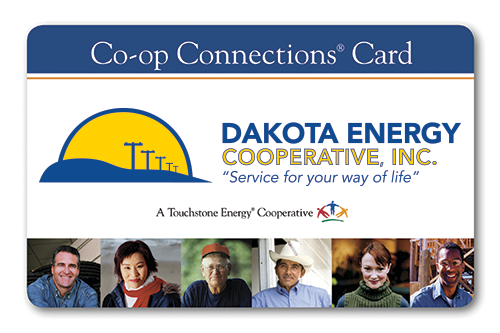 You receive a card when you become a member of Dakota Energy. You can click on the link below to print a list of participating businesses or you can browse online to see the discounts that are available to you. The Co-op Connections member benefit program is absolutely free. Present your card at participating businesses to receive discounts. Privacy & Confidentiality | This institution is an equal opportunity provider and employer.